The 2016 BASE Awards were presented in Manchester, at our conference dinner, on 16th November. 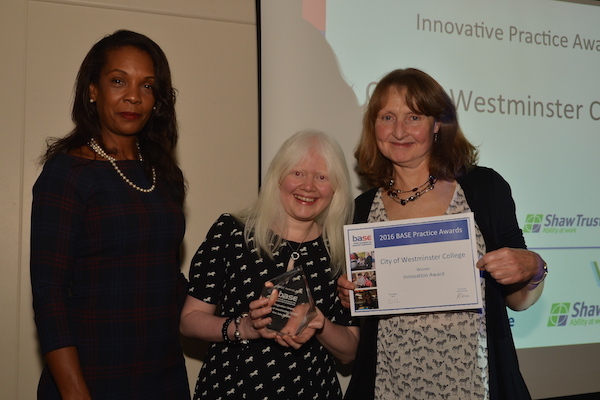 Newham Workplace Supported Employment Team were presented with their award by Alex Stevenson, Chief Operating Officer at G4S Employment Support Services. The award was accepted by Cllr Clive Furness and Anna-Renée Paisley. In 2011-12, Newham Council’s employment rate for people with learning disabilities was 31st out of 33 London boroughs at 2.8%. In 2012/2013, Adult Social Care undertook a review of the LBN employment offer. The review found that whilst there was a range of local providers offering employment support in Newham, it was fragmented and patchy. The council published an Employment Strategy that had been developed to support more people with health and social care needs into employment. 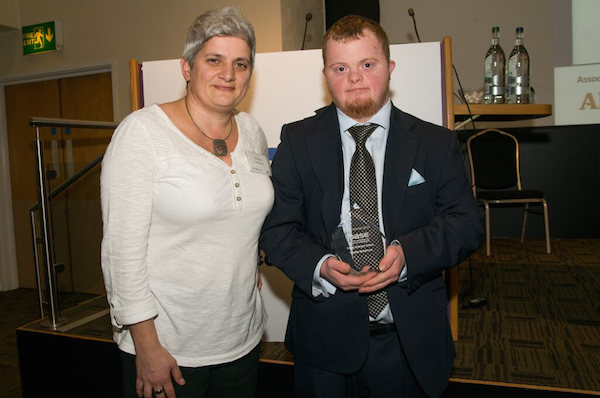 As a result, a new Supported Employment Team based at Workplace was launched in September 2014. Workplace is the council’s mainstream employment support service and has helped over 30,000 residents into employment. 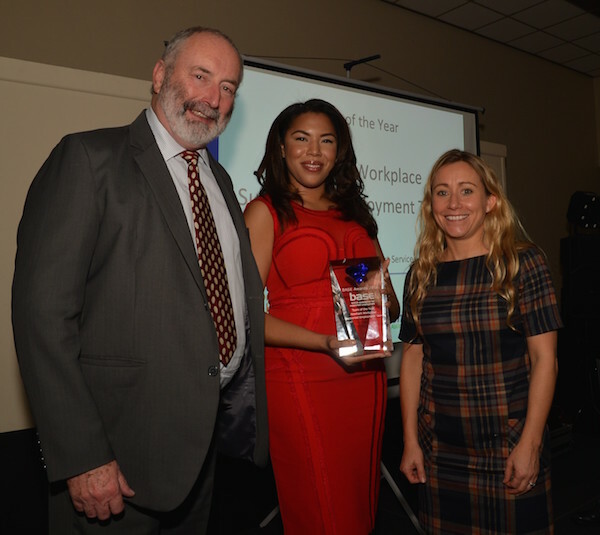 The Newham Supported Employment Team has demonstrated considerable successes since its establishment The team was set an annual target of supporting 31 people with health and social care needs into paid or self-employment. During its first 5 months the team supported 21 people into work. In its first full year of operation (April 2015 to March 2016) the team supported 64 people into work. The team has worked with Newham Council to modify the recruitment processes for people with significant health and social care needs, replacing the formal interview with a two week work trial. The team has supported seven adults into full time employment within the council since then and a further five people are currently going through their probation period. Through further partnership work, the team has also extended the initiative to Barts Health Trust. The team successfully launched a Project SEARCH site in September 2015 working in partnership with Newham University Hospital and Newham College. Eleven people successfully completed the first programme leading to 7 jobs offers at the hospital, 2 jobs outside the hospital and a further two people waiting for job interviews. The team has also taken responsibility for oversight of the LBN Micro-Enterprise and Disabled Entrepreneur pathway. This focuses on supporting people with health or social care needs to enter self employment and/or start their own businesses. Newham are moving in the right direction and have just found out that they are 14th out of the 33 London boroughs this year with an employment rate of 7.8%. 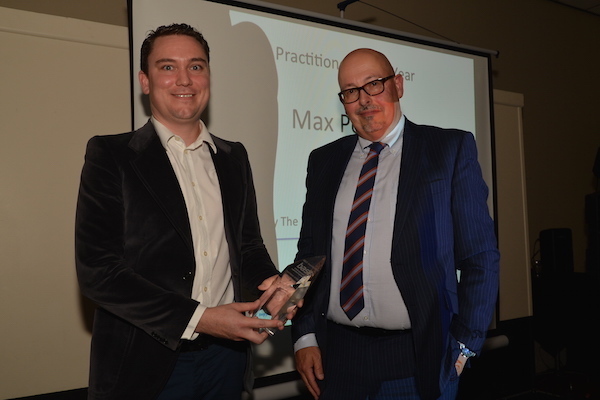 Max was presented with his award by Jerry Stokes, Managing Director of The Work Company. Max works for Three Cs, a London-based service that supports people with learning disabilities and/or mental health challenges to live life to the full and be valued by their community. Since he started in post of Job Coach in April 2014, Max has supported 27 people into work experience and 28 people into paid employment. Max has supported 37% of people at Three Cs who wish to work into work. Max has not only achieved success getting people into paid work but also in supporting them to flourish within their role. He was commissioned by the Royal Opera house to support one of their apprentices who was struggling to manage his stress at work. Max worked with him on confidence building, work coping strategies plus approaches to wellbeing. By the end of their 10 job coaching sessions, the apprentice had passed the course and was able to secure employment at The Royal Opera House. He was the youngest apprentice to be employed by them. In order to secure these successes, Max has had to be hugely resourceful and innovative. An example was ‘Job Spot’ where all Three Cs staff were encouraged to photograph jobs they saw in the local area and email them to Max so that he could create a bank of opportunities. Simple and cost effective - yet it opens up opportunities that might otherwise have been missed. The project has effectively mainstreamed the employment of students with learning disabilities within the College and has involved roles supporting every level of the institution, from the Governing Body, Executive Secretariat and staff development, through to maintenance and catering. The team has also made a commitment to disseminate this good practice, producing a short film with interviews of students and their managers describing the benefits and outcomes from the scheme, which in turn has been shown to employers at the College’s own employer events. 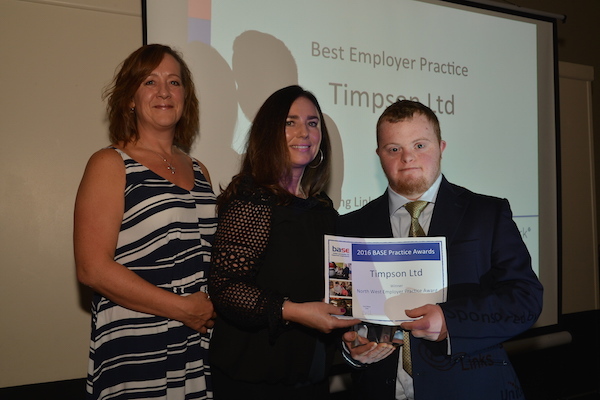 The award was presented to Timpson Ltd, represented by Donna Johnson and Timothy Broadhurst, by Bev Foard, Regional Partnerships Manager at Working Links. Timpson are a family run business who never forget that without employing great colleagues they wouldn’t have a business in the first place. They take the view that when colleagues are happy; they care about the service they provide which in turn is good for business. 50% of new recruits are recommended by an existing colleague. Timpson actively look to other areas to recruit ex-offenders and people who are long term unemployed and consider anyone for their vacancies as long as they are able to do the job. When they met Tim Broadhurst in September 2015, they were all impressed by his enthusiasm and felt that he would fit into the team very well. In Tim’s trial he showed aptitude to meet requirements of the role. Over the past year Timpson have invested in training Tim in a variety of roles throughout the business, both at Timpson House where he’s based and also in a local branch. This has given him a better understanding of how they work as an organisation and how he fits into the company, making a valuable contribution in a variety of areas. Timpson are committed to supporting Tim to develop his career and their values and practice are actively contributing towards supporting people to achieve their career aspirations, whatever their different abilities. 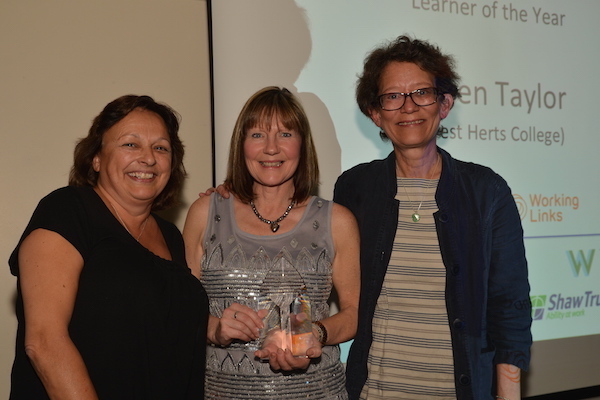 Karen was presented with her award by Liz Mellor and Kathy Melling from BASE. Karen enrolled on the Hertfordshire Certificate course and Liz and Kathy found her a pleasure to teach. She came to the taught days with interest, enthusiasm and a genuine desire to learn, for the benefit of the young people she supports to ensure they leave education with jobs and sustainable careers. Despite being in difficult circumstances at the time (a house fire! ), she sent evidence through steadily which was a joy to read! We suspected her to be a strong practitioner and this proved to be true, when Liz undertook her workplace assessment. She had clearly taken everything she’d learnt on board and was putting it all into practice. She has raised awareness of the core values of supported employment with the team, reviewed and honed her skills and practice with student engagement, vocational profiling, job matching and in work support, all to the benefit of the young people she supports. She demonstrated a strong relationship with employers, which culminated in her writing an insightful blog on the college website. She continues to keep in touch with lots of questions to further improve their supported internship provision to ensure those with the most significant disabilities benefit, which includes progression route development with Woodfield School. Tim is a huge asset to his employer, a valued and respected member of his community and a wonderful advocate for the success of supported employment and WorkFit. 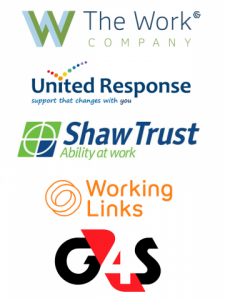 We would like to thank our sponsors who have generously supported these awards. Please take a moment to visit their websites.